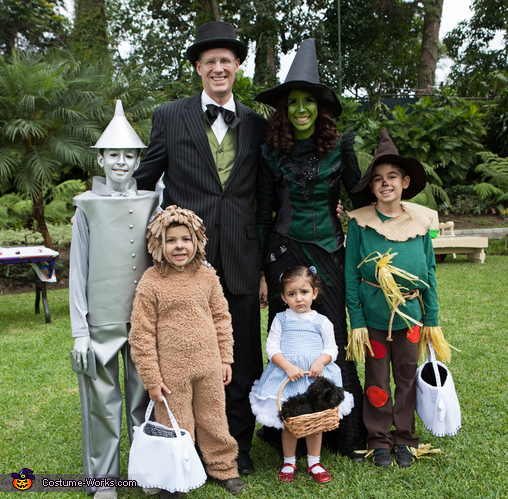 Dad is the Wizard, mom is the Wicked Witch of the West, and kids are the Tin Man, the Cowardly Lion, the Scarecrow and Dorothy. All the children's costumes were homemade and the witch costume was bought. The Tin Man costume was made from silver vinyl. I cut an oval from the vinyl and sewed it to a rectangle vinyl piece and added an oval foam underneath that sat on the shoulders so the barrel would keep it's shape. The buttons are half pearls spray painted silver. The pants are also made out of the same vinyl. The hat is a funnel spray painted silver. The silver face paint is Graftobian Metal Mania paint bought on Amazon. This stuff is great and doesn't rub off and washes off easily with soap and water. Perfect for kids! The Cowardly Lion is made out of soft fluffy fabric and it is two whole pieces sewn together, except for the arms. The Scarecrow is just a green shirt and brown pants with patches sewed on. The "straw" is a hula skirt that I cut into smaller pieces and added velcro so it would stay on the wrists and ankles. The hat is made out of felt. Dorothy is made out of a lightweight gingham fabric shirred on the back so it would slip on and off easily. The underskirt is a petticoat bought on Zulily. The red shoes are from Target. The witch is an Elphaba costume bought on Ebay. The green face paint is Lime Green Classic Snazaroo Classic Face Paint bought on Amazon. The wizard is just a suit dad had with a magician hat bought on Amazon and green tuxedo vest. The sloppy bow tie I made.